Was your roof damaged in the recent wind storm? Terrace Home Exteriors can help! 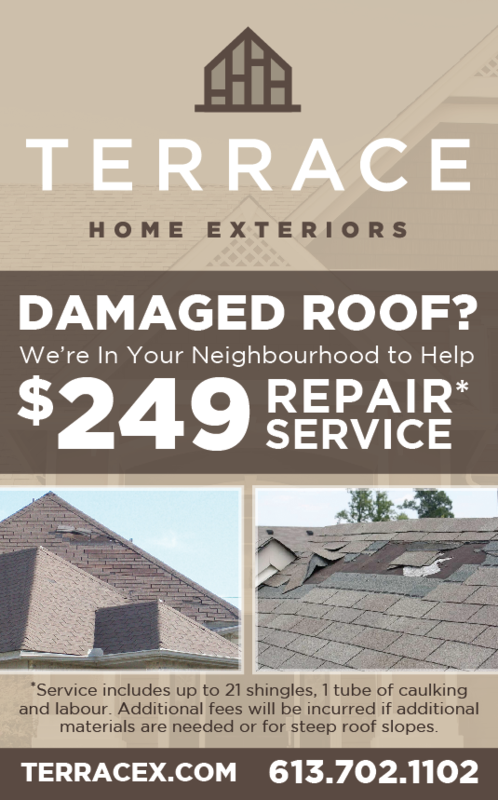 For a limited time we’re offering residents in Ottawa and the surrounding area a roof repair and tune-up service to replace missing or damaged shingles resulting from extreme wind. Our package includes full examination, up to 21 replacement shingles, caulking, and labour. Additional fees will be charged if more than 21 shingles are required or for roofs with steep slopes. Contact us today to book in your emergency service! No Matter what type of roof your have we are experts at finding leaks in existing roof surfaces on commercial and residential roofing. Whether your previous contractor made a mistake, or your older roof looks like it may need a repair, let Terrace Home Exteriors help you pinpoint your problem areas, and help you find the best solutions to solve them. Contact us today for a roof repair estimate.